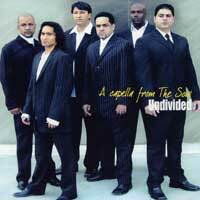 Unidivided is a Southern California a cappella male sextet first formed in the spring of 2001, whose wide range of musical influences include Latin, Gospel, Contemporary Christian, Reggae, Pop, Jazz, R&B and Rock. We first were blown away by the group's distinctive style at the 2003 National Finals, where their arrangement of "Amazing Grace" drew a huge ovation from the audience. Their recent accomplishments include 2 CARA award nominations and another win at the 2005 LA Sweeps Regional, bringing them to San Rafael for the 2005 Finals. "From The Soul" is basically a Gospel CD, but it begins with the showy, funky "Jamappella," with fake horns, classical samples and a pure, sweet whistled melody line as powerful as that in any spaghetti western. "Lord I Lift Your Name On High" is a joyous reggae gospel tune that had us boogying in the aisles. "When the Roll Is Called Up Yonder" would hardly be recognized by its composer, with vocal percussion, "trumpet" solo and funky arrangement that turn the song into a celebratory romp. "What a Friend We Have in Jesus" appears twice, first as a jazzy, bluenote harmonic feast, and at the end of the CD with added vocal percussion. "I Wanna Change," "Nao Ha Deus Tao Grande Como Tu," "Amazing Grace," "Es Jesus" and "What's Going On" complete the songlist. 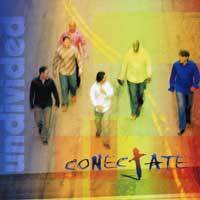 A surprising, upbeat debut CD from one of the most dynamic and innovative Contemporary Christian groups we've heard! All male sextet Undivided draw their musical influences from Latin, Jazz, Contemporary Christian, Gospel, Reggae, Pop, R&B and Rock, and they showed off their powerful, rhythmic live show to us twice, at the 2003 and 2005 Harmony Sweeps Finals in San Rafael, CA. "Amor" is the group's second finely-crafted recording, their first being the excellent "A Cappella From The Soul." There are 10 cuts here, the salsa-flavored "Los Fariseos," and rhythmic gem "Amor Verdadero," both of which feature Undivided's trademark faux horns, and the soulful love song "Contigo Para Siempre;" "La Murga De Panama," "El Nazareno" (a song about Jesus), "Jala, Jala," "El Todopoderoso" and "Ahora Vengo Yo" (with more of those smokin' faux horns) will get you up dancing and ordering another round of Margaritas; while "Bello Amanecer" and "Amanda Mia" are slower, bluesy salsa-jazz. All songs, and the liner notes for that matter, are in Spanish. But don't let that stop you from enjoying this spirited, high-energy collection from one of SoCal's most dynamic a cappella groups! Released at the same time as "A capella from the Soul," "Conectate" includes many of those songs, sung in Spanish. "Dios tu Nombre Exaltare," for instance corresponds to the reggae Gospel tune "Lord I Lift Your Name On High," "Cuando Suene La Trompeta" is "When The Roll Is Called Up Yonder," "Oh, que amigo nos es Cristo" is "Oh, What a Friend We Have in Jesus," "Sublime Gracia" is "Amazing Grace," etc. "Jamappella," "Es Jesus" and "What's Going On" appear on both CDs. Two songs are new, the salsa romp "Dame una Sonrisa" and the breezy title tune. 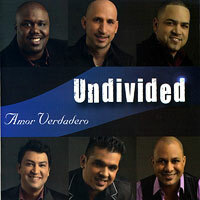 Undivided's pure vocal power and feeling is underscored on this wonderful, all-Spanish Contemporary Christian CD.